For eight years in the company’s heady growth period of the 1990s, John Wood was a marketing director for Microsoft, working in foreign markets in Australia and Asia. Seeking a break from the hectic pace of his executive’s career, Wood took a vacation, hiking through Nepal. The decision to veer off his planned course and follow a district education resource person to a see a school with no desks and only seven books under lock and key in the library sparked his desire to do a book drive for the school. He committed himself to the project before he even left Nepal by sending an email to his friends and family from a cybercafé in Kathmandu. A year later, he returned with eight donkeys, each bearing two brimming boxes of books. 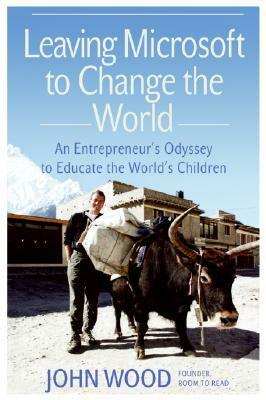 Wood soon found that his enthusiasm and drive for the literacy project far exceeded his interest in working at Microsoft, so he made the decision to quit his job to found what would become Room to Read, but was initially known as Books for Nepal. One of the most interesting aspects of Leaving Microsoft to Change the World is the dual nature of Wood’s relationship with the organization that he left. On the one hand, Microsoft China’s narrow view of philanthropic work stoked his zeal for his own project and helped solidify his decision to leave the company. Bill Gates, a noted philanthropist himself, shook Wood’s desire to remain with the company by failing to properly prepare for an important television interview on a visit to China. Despite Wood’s aversion to the quid pro quo culture of corporate philanthropy, he approaches non-profit work with a businessman’s attitude, and a focus on results. In the early days, he ran Room to Read like a tech start up, zealously maintaining low overhead, minimal staffing, and rapid expansion. Although he couldn’t, in good conscience, stay with Microsoft, but he wouldn’t be where his is today without the company, either. The personal side of Wood’s story is both humanizing and disheartening. Overworked at Microsoft, he is obviously made happier by his decision to leave the company and found Room to Read, which he is more passionate about. But soon he is as much, or perhaps more, of a workaholic in his new position. He candidly reveals the lack of attention to his personal affairs, such as renewing his driver’s license and car insurance. Starting Room to Read also necessitated breaking up with his girlfriend, who wasn’t interested in traveling in developing countries, or giving up a comfortable salary. One of the few positives on the personal level seems to come out of Wood’s relationship with his father. Neither tense nor particularly close, the two bonded over the initial book drive, when Wood’s parents served as the US collection point for the books, and his father eventually accompanied him on his trip to Nepal to deliver the library. While there are some heart-warming stories about the benefits of the libraries for the communities, and plenty of detail about the number of libraries built and books donated, the focus is largely on the business side of the endeavour. There are no details about the day-to-day workings of the library in the absence of Room to Read workers, or stories about libraries that have faced difficult challenges after their inception. Wood is a clear, if not especially skilful writer. He is able to convey his vision and passion, and articulate how his business experience and connections made him a successful philanthropist. I would recommend this book more for those who want to understand the history of Room to Read, and the business side of charity work, than for those who are looking to gain a deeper understanding of educational issues in the developing world.